Although many people believe that Northfield should try to build on existing assets, such as the two colleges, the emerging medical campus, or our authentic downtown, there are a few among us that seem to resist such an approach. Whether it’s based on hard-headed financial analysis, a seeming lack of enthusiasm for the colleges or a testosterone-driven lust for heavy equipment, there is a small group of people who remain focused an achieving an industrial component for Northfield’s future. As one long-time economic development observer summarized this viewpoint, unless we’ve got the smokestacks of Pittsburgh, we really haven’t made it. Fortunately, there’s a new possibility for Northfield’s industrial sector. 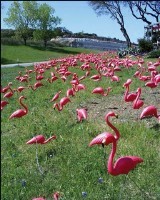 It’s the manufacture of plastic landscape enhancements, specifically, pink flamingos. The manufacturer of these “icons of kitsch” for almost 50 years, Union Products of Leominster, Massachusetts, has closed down the flamingo factory. Citing the rising cost of petroleum-based plastic, the company will build no more birds. I think it’s a great opportunity for Northfield. As a young man, I barely noticed these lawn decorations. Then I moved to Madison, Wisconsin in 1981. I heard tales of how an anarchist student organization (I think they were known as the Pail and Bucket Party) working for the radical decentralization of power, planted a thousand plastic flamingos on the campus in an effort to further their political goals. I didn’t quite understand it all but it sure made me see these pink birds in a different light. In a recent Strib article about economic development efforts in Northfield, our community was described as “quirky”. I chose to interpret that word to mean that we are quirky in a good way and that we are creative, innovative and “think outside the box”. With, what I believe to be, a strong asset base of creative types, not only does Northfield have the potential to take the design of these plastic birds in a variety of new directions, ramping up for big production runs and generating a bunch of new jobs, but what a great symbol it would be for our “quirky” community. Heck, maybe we can make them out of a corn-based plastic. I can see the signs welcoming people to our community now…”Flamingos, Fabricators, and Free-Thinkers”. Somebody get Leominster on the phone! HEY! I never said what you said I said. Again.